Life Alert is good, but a few tweaks to your home renovation plan can actually prevent falls later in life. A little over a year into The Estate Planning Ticker, I’ve come to find that articles can be inspired by just about anything. Some are obvious – a new law, a sage or misleading news story, a cautionary tale manifested in a recent client; some less so. In this case, I was inspired by two consecutive life experiences. First, watching my mother put her insight as a geriatric nurse into practice as she renovated the family home, and second, helping to move her mother out of her home of 40 years because it had become unsafe. 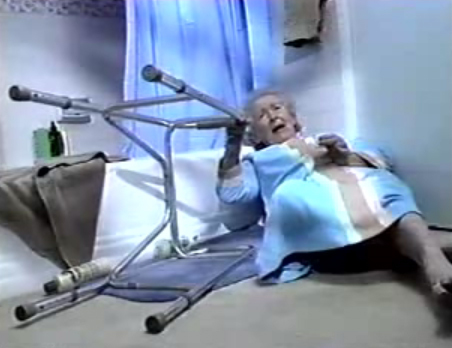 Falls are among the most prominent health risks facing elderly Americans. They can cause serious injury, make you feel defeated and embarrassed, and terrify your adult children. That last bit explains why it’s one of the most frequently cited reasons for children to pressure their parents out of the home and into some form of managed care facility. What makes it that much worse is the simple fact that most falls, as well as other physical difficulties around the home, are completely preventable. If you’re fortunate enough to have a home where you intend to spend your later years, and are planning renovations big or small, there are some simple considerations which, for an extra few hundred dollars, may save you from aggravation, injury, or additional contractors later in life. After the jump, a checklist of the more important considerations of elder-living architecture. As we enter old age, our reflexes slow, our posture may weaken, and muscle mass diminishes. The latter causes older people to walk without lifting their legs as much as they used to, and when encounter a threshold, crack, uneven surface or wet spot, they can’t compensate quickly enough to avoid a fall. Due to reductions in bone density and fatty skin tissue, such falls can result in massive bruising, widespread soreness, and even broken bones, far extending the severity of the trauma and length of recovery as compared to a younger person. During recovery, this further limits a person’s range of motion and quality of life. An extension of the weakness and tripping issues that impact older individuals is the difficulty older individuals face with stairs. Many are so weak that just two may strand them on a particular floor of the house. Because of this, it is important that you be able to live comfortably, day-in and day-out, on a single floor of your home, usually the main floor. If your master bedroom is upstairs, you should ensure that there is a room on the main floor which is usable or easily convertible to a bedroom you would be happy using in the future. If your laundry room is in the basement and you already have a plumber and contractor around, you may consider installing a second set of hookups to a nook or spare closet on the main floor, for use with smaller units in the future. Lastly, if you must use multiple floors, or want to extend your time using them, you should have any contractor take a look at your staircase railings. Lower-end railings are secured with three screws in two places, and in some places they may only be screwed into the drywall. They are there as a guide, and are not designed to support a person’s body weight over repeated use. Wherever possible, having sturdy railings secured to the studs on both sides of the staircase will extend your ability to use stairs in the future. When renovating a bathroom, it may be true the the best place to start is the door. A typical household doorway is 30″, but bathroom doors may be four to twelve inches narrower than that, often making room for a large vanity or linen closet. If you put your hand on your hips and cannot walk straight into a bathroom, that means you will not be able to access it with a walker or enter without shuffling sideways if you use a cane. Where walls are already exposed, a contractor can frame out and replace a too-small door for as little as a couple hundred dollars. That investment can pay off big-time in the long run. If the bathing area is being redone, a shower stall may be easier to access then a bathtub due to the lower lip. At the same time, portable bath stools can be brought in at a later time in either case, if standing is an issue. There are special tub units which have doors for easy access, but these may be eyesores to younger couples trying to spruce up their facilities. No matter what installation you choose, though, preparation should always be made for handrails. If the side-wall is tile, boards should be added between the studs to serve as anchors. If you are installing a prefabricated unit, plywood glued to the back side and rear of the unit can anchor railings later on. This costs hardly anything to do in either scenario. Finally, elderly individuals may have difficulty getting up from a standard toilet seat, which is actually very low to the ground. For a little more money, you can select an elevated toilet bowl, which is not only more comfortable, but eases standing back up and can avoid the need for an elevated seat or portable commode in the future. Flooring. Aside from being in vogue right now, hardwood floors are less slippery than linoleum or tile when spilled on and can be softer on fall. The modern-pre-finished varieties also hold up well without significant maintenance. Cabinets. As range of motion becomes progressively more limited with age, the type of cabinets you choose may come to effect how much storage space you will actually have access to. Taller wall cabinets (usually 42″) are designed for higher ceilings, but installed lower or with a standard ceiling height may give you access to an additional row of shelving you can easily reach as you settle into your later years. For base cabinets and pantries, double-wide drawers and pull-out shelves, can provide easy visibility and access without having to kneel down or reach. The same is true of corner lazy Susans. Finally, it is wise to ensure you have some large storage spaces so that heavier and larger appliances may eventually be stored close to where they will be used. Lighting. Under- and over-cabinet lighting can be done cheaply or expensively, and while over-cabinet may be primarily aesthetic and under-cabinet mayl only see sporadic use now, they may become essential in later years as eyesight problems become more common. Cutting, frying, and other culinary activities may become hazardous under the light of a standard light bank. Appliances. As with cabinetry, range of motion issues in elderly life can be complicated by the arrangement of kitchen appliances. Wall- or hood vent-mounted microwaves may become impossible to use, and may be worth thinking twice about. Also, the newer trend of freezer-on-bottom refrigerators are optimal for ease of viewing and access to the items you need most as limited range of motion and eyesight issues set in. This entry was posted in Elder Law, Observations and tagged Elder Care, Elder law, Falls, Falls in Home, Home Injuries. Bookmark the permalink. How Do I Write Off Tree Damage on My Taxes?